Not so long ago, the best-known image of Hawaii’s food was Dole canned pineapple. Today, restaurants serving poke and katsu chicken are popping up everywhere from Utah to Europe, and Hawaii-nurtured dishes like Filipino pork and loco moco have become part of global culinary culture. How can we explain this growing fascination with Hawaii’s food, and its embrace by diners and heavy promotion by high-profile chefs? 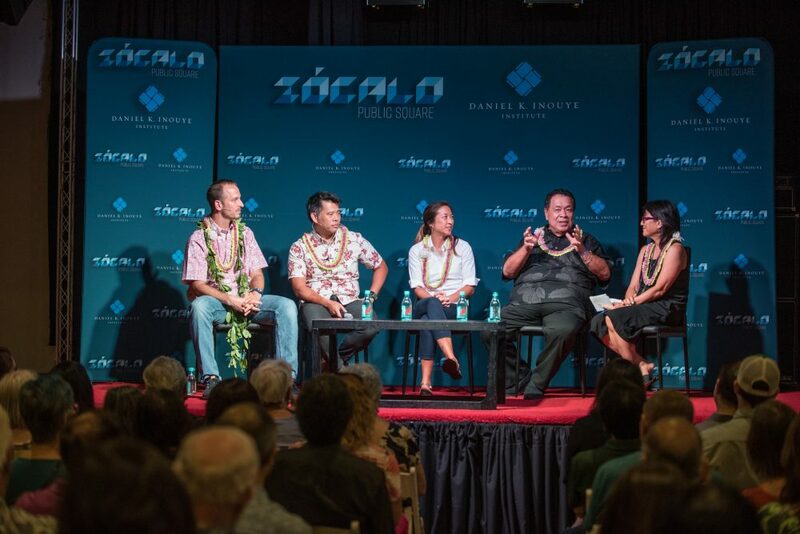 Four panelists took a stab at that question at a Zócalo/Daniel K. Inouye Institute “Pau Hana” discussion at Artistry Honolulu. The wide-ranging conversation took up issues of farming and fishing practices, cultural diversity, and ecological sustainability, as the panelists explained Hawaii cooking’s mouthwatering mélange of Chinese, Japanese, Korean, Polynesian, Filipino, and Portuguese influences. Sam Choy, a James Beard Award-winning restaurateur, chef, and the “godfather of poke,” suggested that Hawaii food culture had to overcome the past influence of big hotels that hired European chefs who pushed a faux-Hawaiian menu of shellfish drenched in thick, creamy sauces. 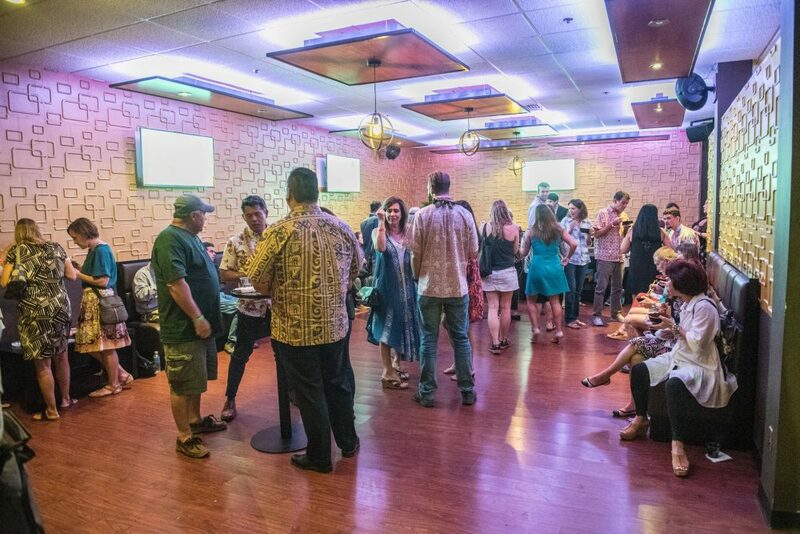 By contrast, in more recent decades, mainland diners have come to appreciate dozens of truly authentic Hawaii dishes that prize fresh ingredients and cultural authenticity over pomposity. Much of that shift in tastes is due to popularizers like Choy, a prolific author as well as a celebrity chef, who has cooked and devised menus for some of the world’s biggest cruise liners, and gives demonstrations at venues like Harrods food court in London. Jordan Keao, a Hawaii-born executive chef and owner of San Francisco’s ‘aina restaurant, said that mainlanders enamored of his home state’s cuisine may not be aware of the culture that produces it. “We all know it’s sitting in a garage over a hibachi grilling chicken and pork,” said Keao, who thinks that Hawaii’s food deserves to be as popular as any of America’s other great regional cuisines. While Hawaii is doing a better job of showcasing its edible heritage, mainland U.S. businesses are being more aggressive in seeking out the Aloha State’s tasty exports. Food writer Martha Cheng said that a publisher approached her to pen The Poke Cookbook, a sign that “the Hawaiian brand is really strong right now.” She thinks the state’s tourism board has done a great job in promoting local cuisine, and the rest of the United States is responding to that pitch when it comes to food. “People are just looking for something unique, that tells a story, that has deep roots, and Hawaii definitely has that,” Cheng said. 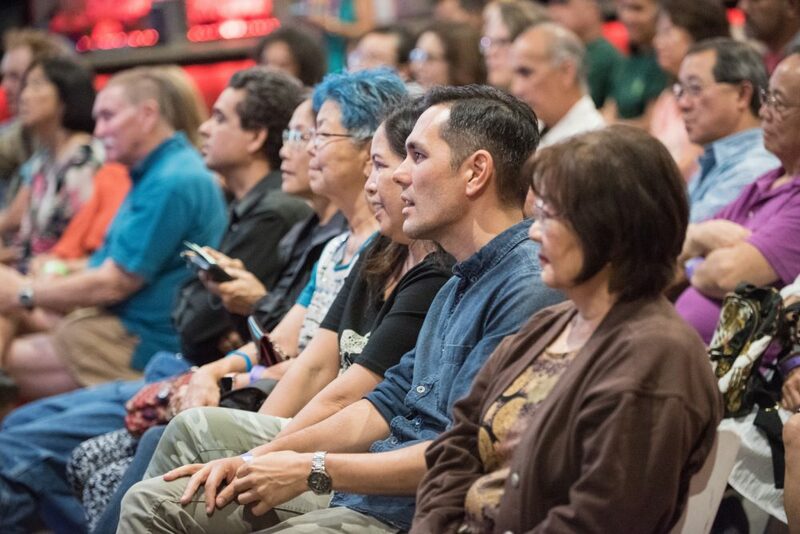 But are diners really thinking about a story when they’re chowing down, asked the panel’s moderator, Noe Tanigawa, an arts and culture reporter for Hawai?i Public Radio. Keoni Chang, corporate executive chef of Foodland Super Market, replied that he thinks they are, perhaps at a subconscious level, and he believes that the island’s warm, communal spirit gets translated through its cooking. While surfing and slack-key guitar music have wafted across the Pacific and gained broad appeal, food may be Hawaii’s most expressive form of culture. But can visitors to Hawaii, Tanigawa asked, actually be changed by the food they eat? Still, providing a first-rate Hawaii dining experience in a single restaurant is different from replicating that experience on a mass scale. How does Chang manage to keep his supermarkets stocked with high-quality, authentic foods and ingredients? Tanigawa asked. Keao agreed that authenticity is essential if you want to bring the island vibe to the Lower 48; he said that his restaurant, for example, is the only place around the Bay Area that offers hand-pounded poi. Choy, the celebrity chef and author, said that it’s important to tell people the journey of a dish like poke, as if you were narrating the expedition of the 1947 Kon-Tiki raft odyssey that showed how cultures advanced across the Pacific, from Asia to the New World. He pointed out that poke has a raw-fish salad counterpart in South American ceviche. Tahiti, New Zealand, and Fiji likewise have their own variations of poke. But “we are the motherland of poke,” Choy declared, prompting scattered applause. “You want to clap, you clap!” Choy urged the audience. They did, and loudly. Tanigawa brought up the sensitive issue of whether the global poke craze, like other food fetishes, may be hazardous to the planet’s health. “Are we just hell-bent [on] depleting our fish stocks? Tanigawa asked. “I personally think so,” Cheng replied. All the panelists agreed that chefs and writers must convey the right messages about the need for careful stewardship of our fields and oceans. Market supply-and-demand, too, will help maintain the balance between food trends and affordability, Choy suggested. “When fish is $40 a pound, it’s time to roll out the Aloha tofu,” he said. (Vegetables, he declared, will be the next big Hawaiian food fad.) Restaurateurs, chefs, and customers also must weigh the ethical dimensions of the often harsh conditions in which fishermen and farmers work, the panelists said. 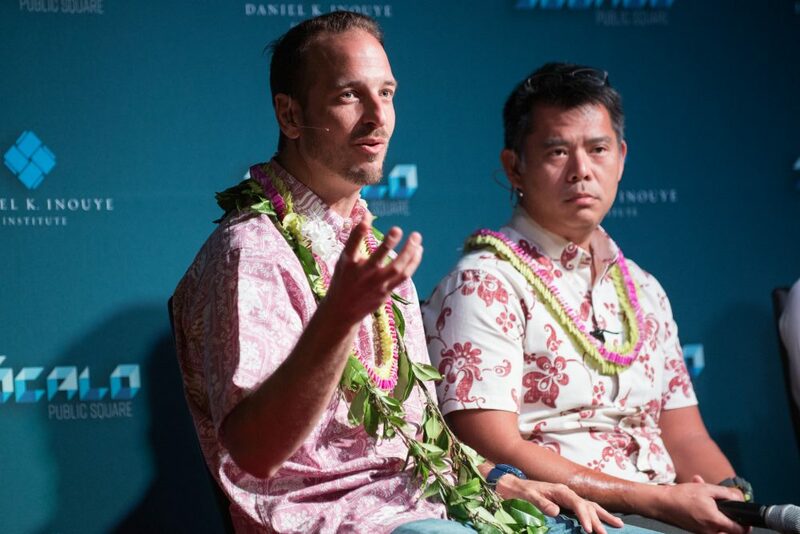 But the chief selling point for Hawaii cuisine, the panelists agreed, is less tangible than fresh ingredients or Pan-Pacific flavoring. It’s a quality that can’t be replicated by Hawaiian knockoff fast-food chains on the mainland—but is part of every meal served on the islands, however fancy or humble.